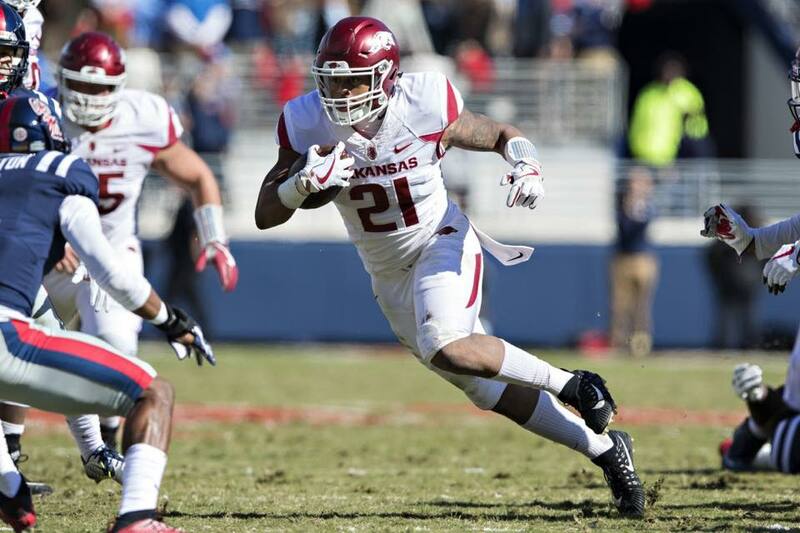 Devwah Whaley of Arkansas football could find himself in the realm of Stanford’s Bryce Love and Alabama’s Damien Harris with a solid 2018 performance. Arkansas football had a surprisingly solid class that it sent to the 2018 NFL Draft, including a first round pick to the Detroit Lions in center Frank Ragnow. Detroit is trying to build up their ground game, as they also selected former Auburn Tigers running back Kerryon Johnson in the second round. The leader for that rushing attack is rising junior running back Whaley. Behind Whaley falls guys like Chase Hayden and T.J. Hammonds. The former four-star prospect Whaley is by far the most talented out of all options the Hogs have in the running back stable, though. Last year was somewhat of a down season by all considerations for Whaley. He was supposed to have a breakout sophomore campaign. Instead, it was more of a sophomore slump. However, you can’t say that the 2017 season was completely one to forget for Whaley as he still averaged well over 4.0 yards per carry and set a career high in rushing touchdowns with seven. A shake up in the coaching staff could be exactly what Whaley needs to have a solid junior season, and build his draft stock toward a possible early declaring for the 2019 NFL Draft. Bret Bielema had worn out his welcome with the Hogs, and some new-found running room for Whaley would definitely be a welcome sight. Walter Football ranks Whaley as a top 12 running back in the 2019 class. That projects him as a selection between rounds four and six. For all intents and purposes, this is a low ranking due to Whaley’s tough go last season. Putting together a good 2018 could pretty easily move him into that top 10. Racking up around 900-1,000 rushing yards would not only put Whaley on the map, he could see a projection as a second or third round pick in the 2019 NFL Draft. Arkansas could also use an offensive leader to step up like that to move back toward postseason eligibility.